We've assembled these very cool items because, well, they're just too much fun not to play with! There are all types of Kraft items included in this kit! 1 Quietfire Rubber stamp "Fill Your Paper"
I challenged the lovely and talented Wanda Hentges (because we know what she likes!) to see what she might come up with. Her wonderful collection is full of variety. Thank you Wanda! 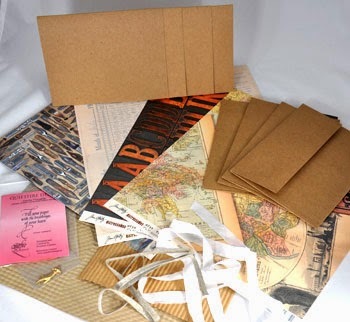 Linen ribbon is colored with Distress stain as is the torn edges of the textured kraft paper. The ribbon is colored with Distress Ink and attached to the card with double sided tape. Put the tape down on the card, use a toothpick to press down the ribbon in one spot, move forward on the ribbon and press down again right next to last spot - this creates a ruffle. The ribbon is twisted before tying around the tag to get a narrower strip. 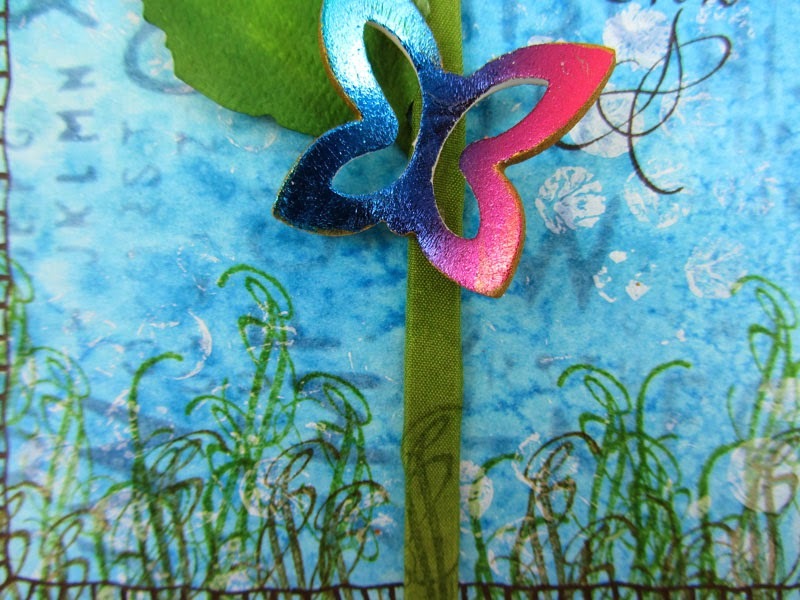 The center of the butterfly is a paper bead created with the same paper but using the flip side. 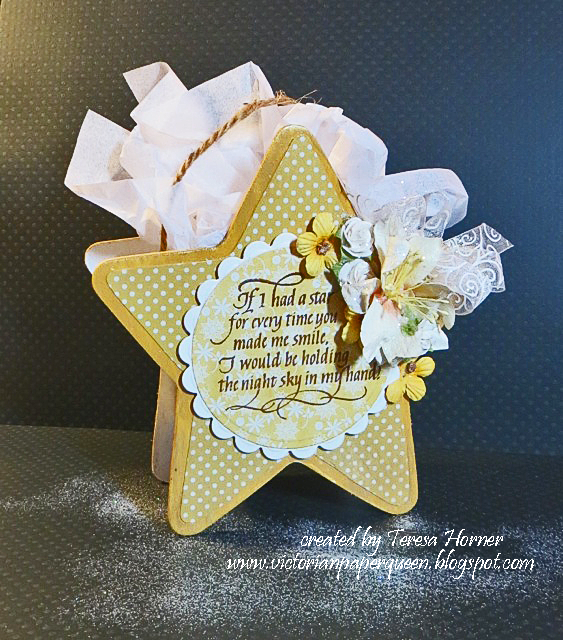 Share your Vintage Kraft Kit creations with us on Facebook! We love to see what you've done. the way it came out using the wood and paper together. under the paper as it is drying so it will be flat and nice. Scalloped Circles to put under it to make it stand out more. to someone special that i have in mind. Suzanne, Queen of Quietfire attended the Prime Publishing Blogger event at Winter CHA in January (you can read about that here). She graciously bestowed a box of swag on her loyal DT Shepherdess (moi!) 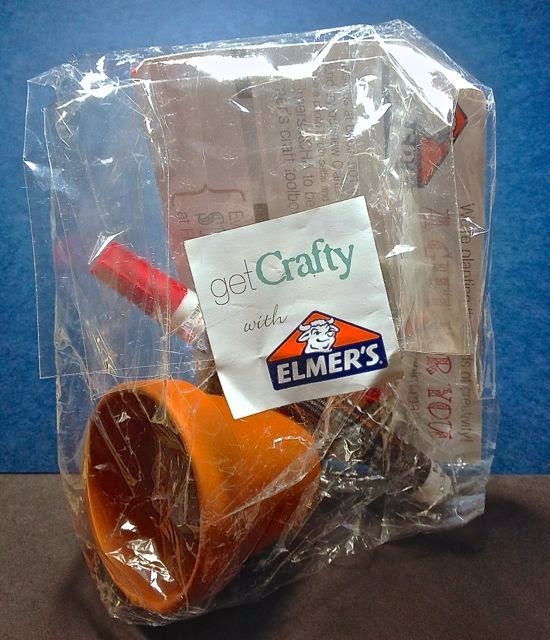 to see what fab projects could spring from said swag, donated by several craft companies. and opened to reveal these items featuring their Painters Pen , a water based, permanent when dry paint marker, with a versatile medium bullet tip. 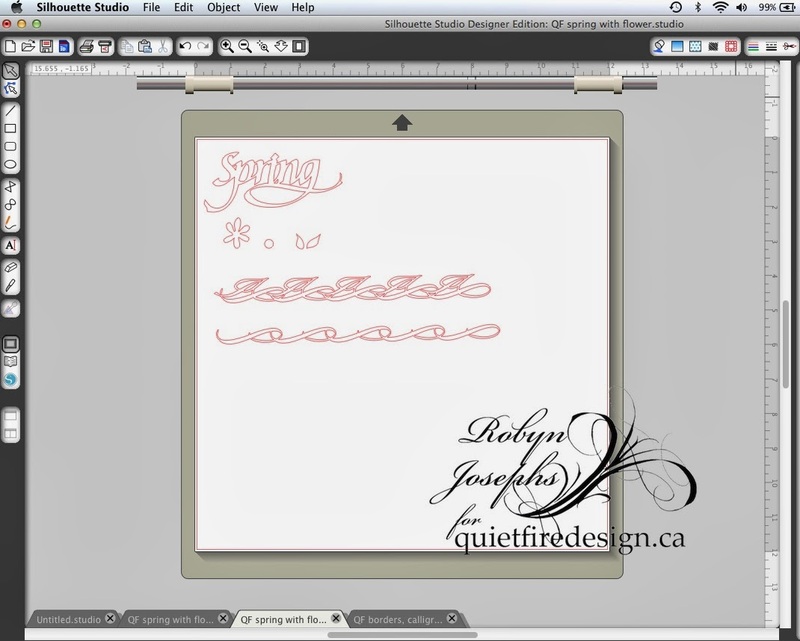 I love a challenge, and still I was stuck, until I got the latest Quietfire Digital Cut files in the Silhouette Store! 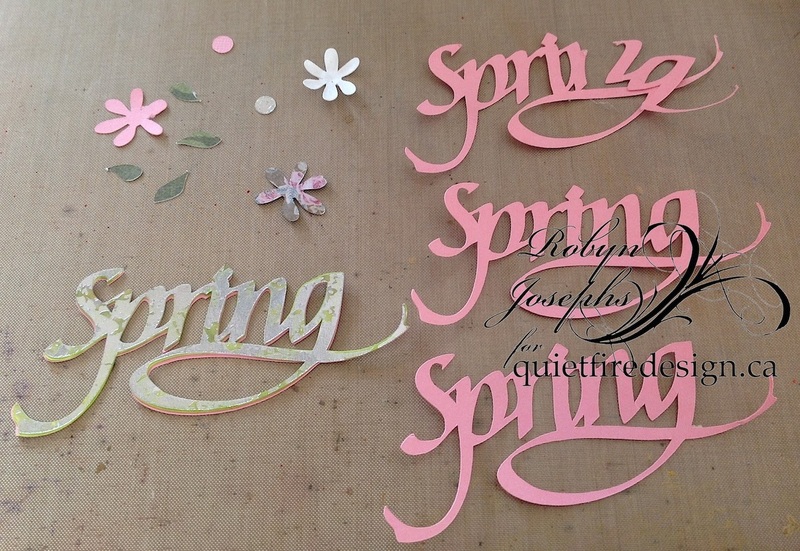 Cut digital files from paper, making several copies of the word spring. Here is the screen shot of the files. Here they are ready to assemble. 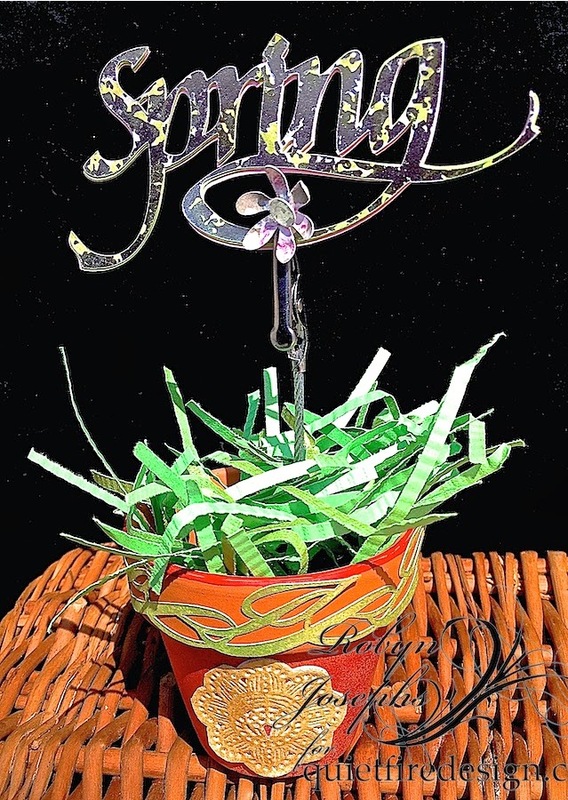 Layer up the word using the glue marker to make a strong dimensional element, with the mirrored paper on top. One piece tore, so I put that in the middle! Be patient taking these off of your mat. Use your tiny spatula. Put the Elmer's Painters pen into the spritzer and spray randomly onto the pot. Draw as you will for added accent. Adhere the doily and border with Dotz. 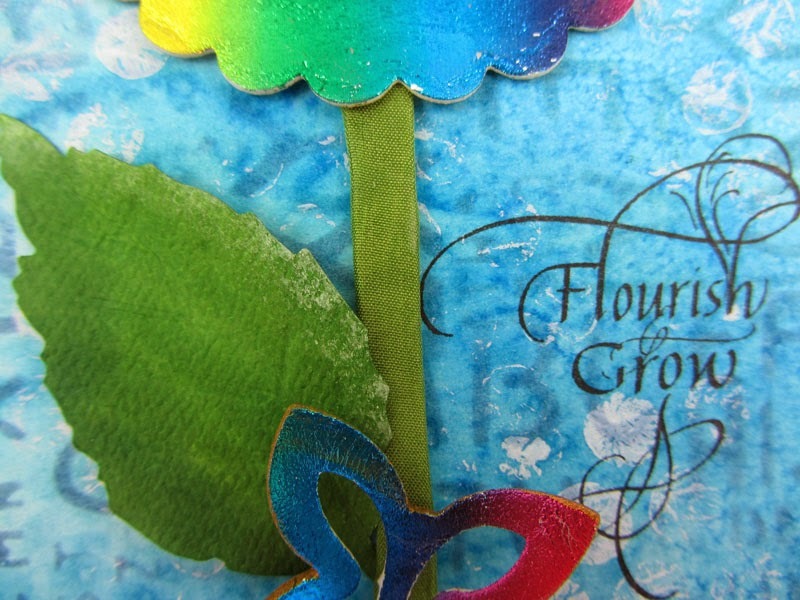 Shape your flowers using dry embossing tools. The paper petals easily go from flat to fancy by pushing the paper with the tool into a mat or mouse pad. Quietfire has a nice set of tools, these I've had forever. Adhere the flower elements with Dotz. The sentiment is held up with a memo holder. Glue a heavy washer to the bottom to add weight. The top is an alligator clip, hidden by the flower. Place the holder in the pot and stuff with the shredded paper. We till have snow! so the wildflower planting will have to wait. Lots more was in my swag box, so subscribe by email and Like us on Facebook so you don't miss a thing! Hello Everyone, what a day! Terre here with a vintage flare kinda card using one of my favorite stamps from Quietfire Design, "Sometimes, said Pooh"! 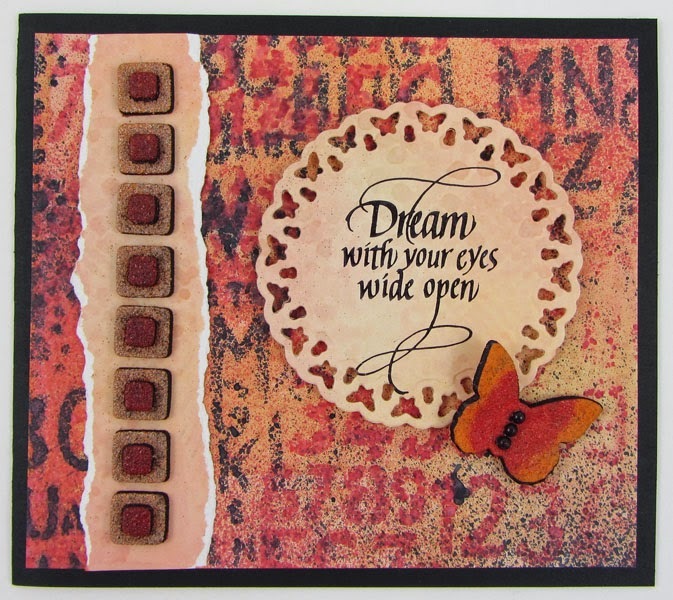 You might also notice a few more favorites such as the new Spellbinders Elegant Ovals die template and some Le Creme Pearls from Want2Scrap. Just follow the Rafflecopter instructions for a chance to win. Your name goes into the hat more times when you do every part, but you can enter with just a blog comment. Good luck! Nina here again guest posting for Quietfire Design. Today, I am highlighting the QFD cut files that you can purchase HERE. These cut files are so delicate and I was afraid my Silhouette wouldn't cut them right, but was I wrong! I love their elegant design and they make a great focal point. 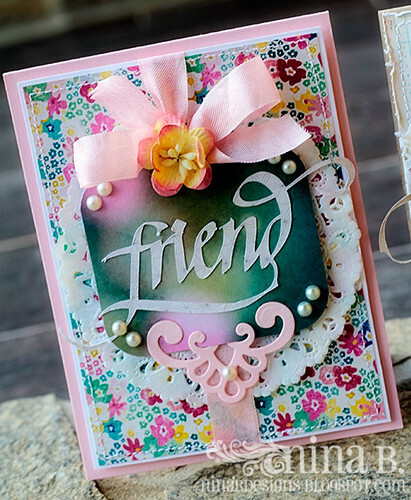 My first card uses the Friend cut file and is vintage shabby with girly pink all over. The doily is by SRM Stickers. I also embellished with a Spellbinders Moroccan die cut, Want2Scrap pearls, paper flower and seam binding. 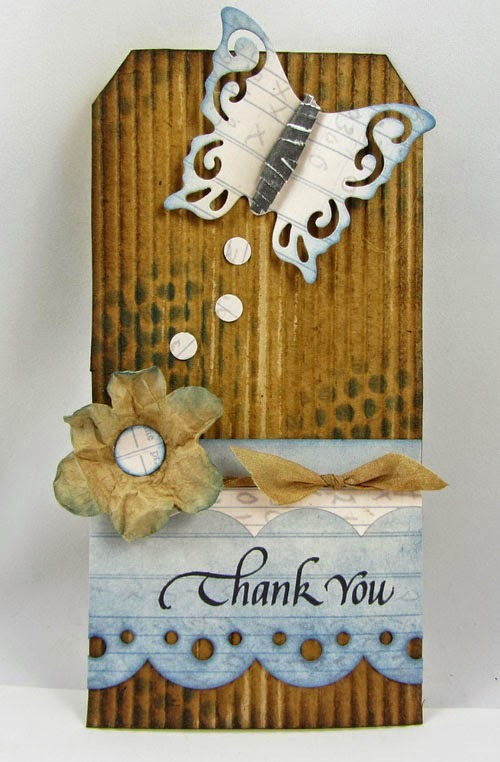 My second card is also vintage shabby, but milder on the girly scale (just my style). This time the focal point is the lovely Thank You cut file. I did some distressing and stitching on the edges and placed buttons to matched the strip of patterned paper (from Crate Paper's Maggie Holmes collection). I think this is the first time in a while that I didn't do any stamping on my cards. With these stunning Quietfire Design cut files, I didn't need to. 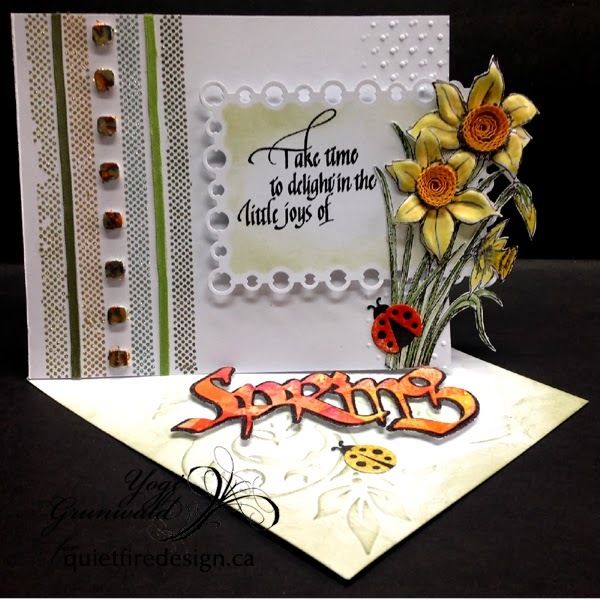 The cut files added more dimension and a different look from my usual stamped cards. And I love the results! 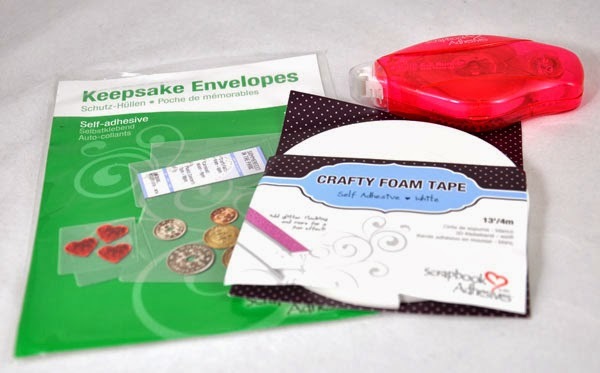 who has won a prize valued at $60 from Scrapbook Adhesives and Quietfire Design! We've sent you an email, so check your mailbox and get back to use with your snailmail address! 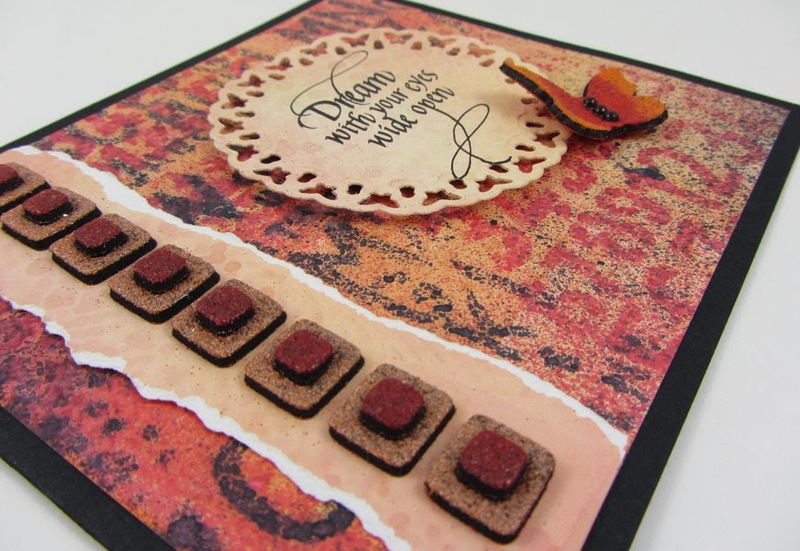 Welcome to our final day of blog hopping with Scrapbook Adhesives! Hasn't it been wonderful? A round of applause for all the designers and the creative ways the adhesives have been used! Pockets. I love pockets. Especially square pockets. When I saw Scrapbook Adhesives had these Keepsake Envelopes I knew they had to be mine. So here is my project. It became much more involved than what was originally in my head because things didn't fit together as perfectly as they had in my imagination. All the heads of hair in our house didn't look anything like baby hair, soooo....I raided my supply of baby hair for this project. Wow, I've forgotten how fine it was! Hold on tightly! 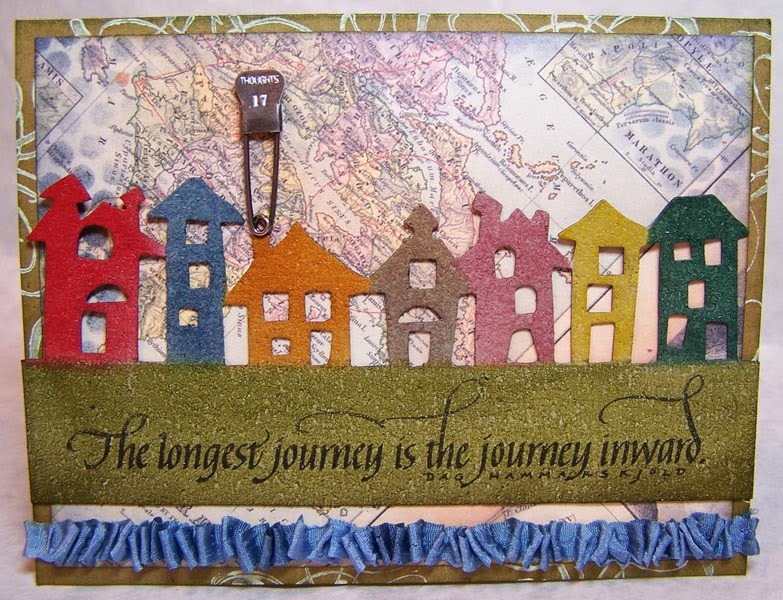 The pocket "elements": Lacey Square and Adorning Square diecuts, Keepsake Envelope and "treasure". 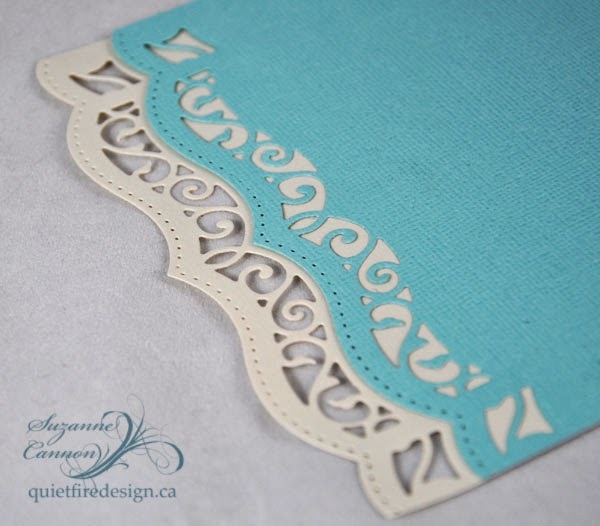 Cut Powder blue cardstock 12" x 6-1/4" and fold in half to make a 6-1/4" x 6 card. Using the appropriately sized dies to fit the 2x2" envelopes, cut three Adorning Squares from cream cardstock for behind the envelopes and three Lacey Squares from blue cardstock to fit inside the envelopes. Cut one rectangle 6-3/4" x 5-1/2" from blue cardstock and one rectangle of the same size from cream. Die cut Bracket Border along the 5-1/2" side of both colours. Layer and adhere the cream and blue border diecut as shown and trim to 6-1/2" using E-Z Runner Permanent Strips. Round corner of cream border diecut. 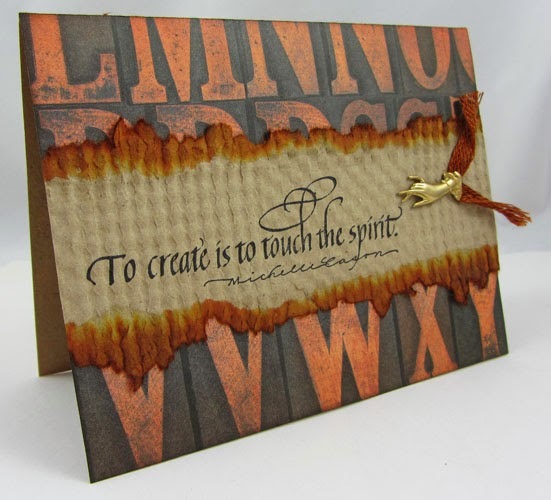 Stamp sentiments using VersaMagic ink and diecut with Labels Ten. 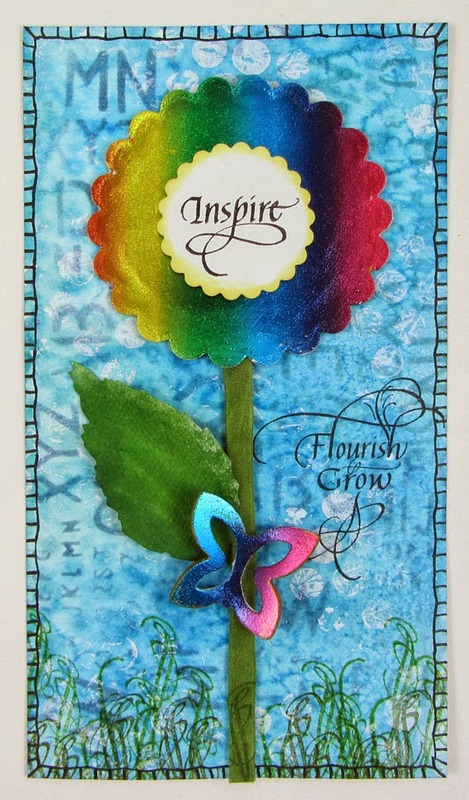 Diecut butterfly and spiral flower from Whimsy die set. Sponge edges with Sea Breeze ink and bend butterfly wings upward. 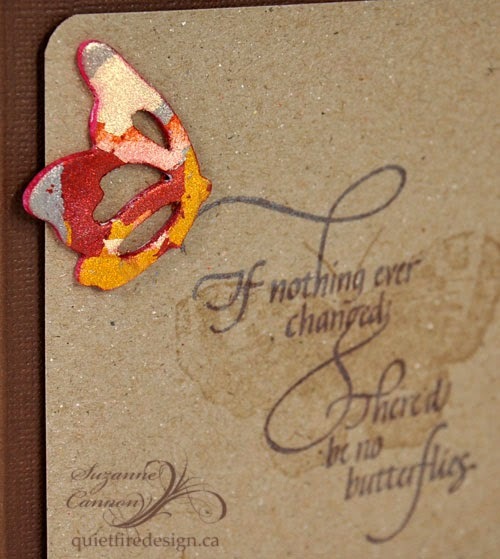 Add pearls to butterfly as shown and use Crafty Foam Tape to adhere to top edge of Labels Ten. 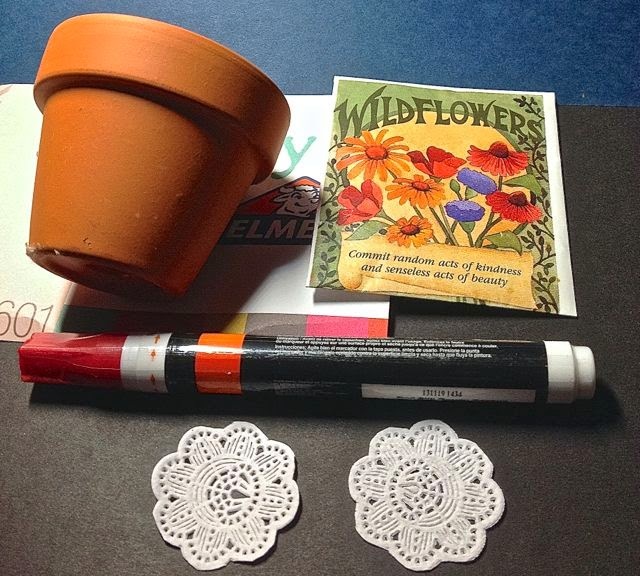 Use Paper Shaping Tools to shape and roll spiral flower and adhere to bottom of Labels Ten. Add pearl to center of flower and each side of the flower. 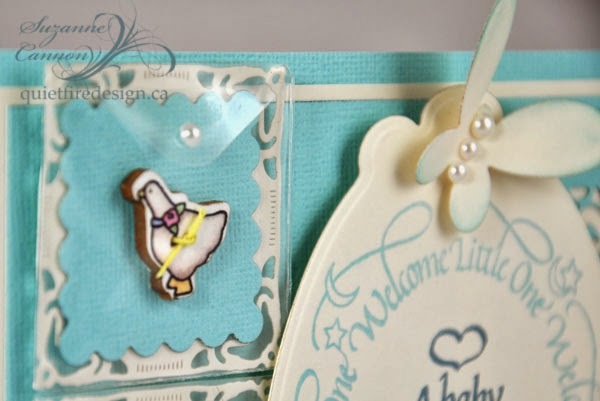 Adhere "treasures" (baby hair, button and sticker) on blue Lacey Square die cuts and put one in each Keepsake Envelope. 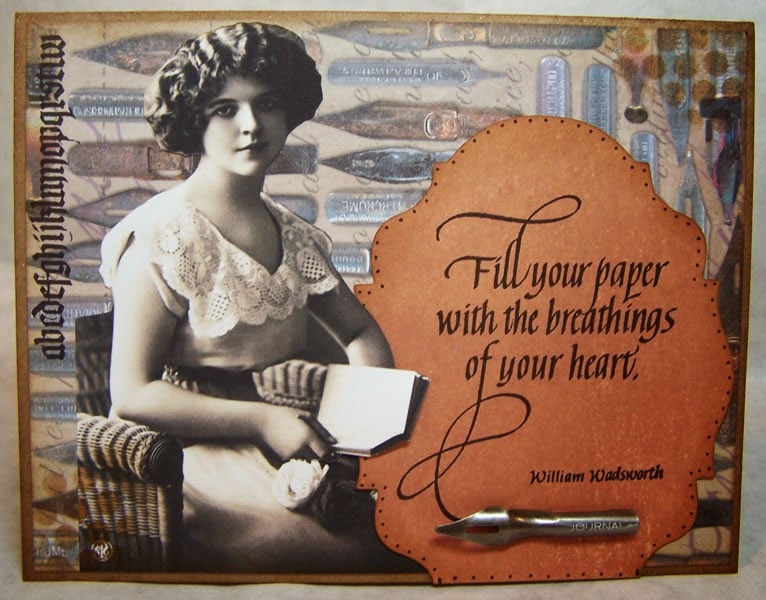 Remove release paper from back of each envelope and adhere to Adorning Square die cuts. Cut one piece of cream cardstock to 5-3/4" square and use E-Z Runner Permanent strips to attach it to the card front with edge aligned to opening edge of card. Adhere panel with diecut borders on top with cream edge extending beyond the edge of the card front. Use Crafty Foam Tape to adhere Keepsake Envelopes down left edge of card as shown. 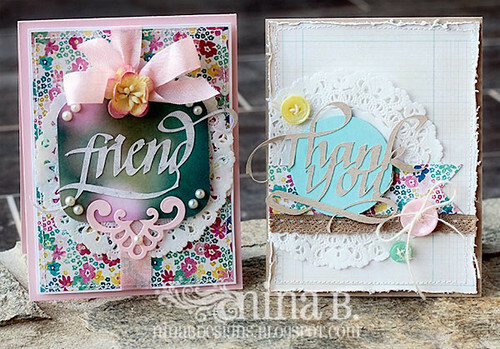 Use two layers of Crafty Foam Tape to adhere Labels Ten to the card front as shown. 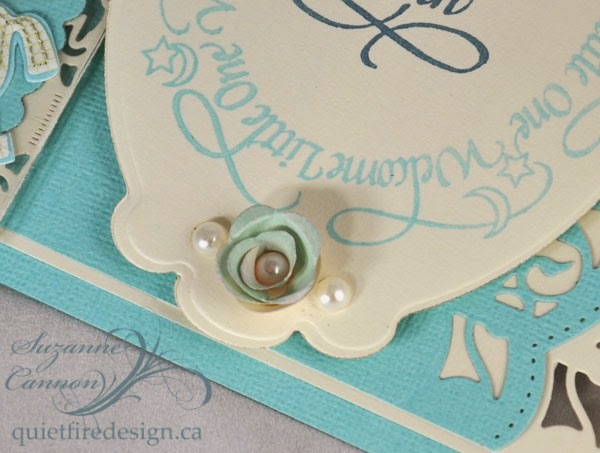 Add pearls to the flap on each Keepsake Envelope. Here is another, much less complicated card! 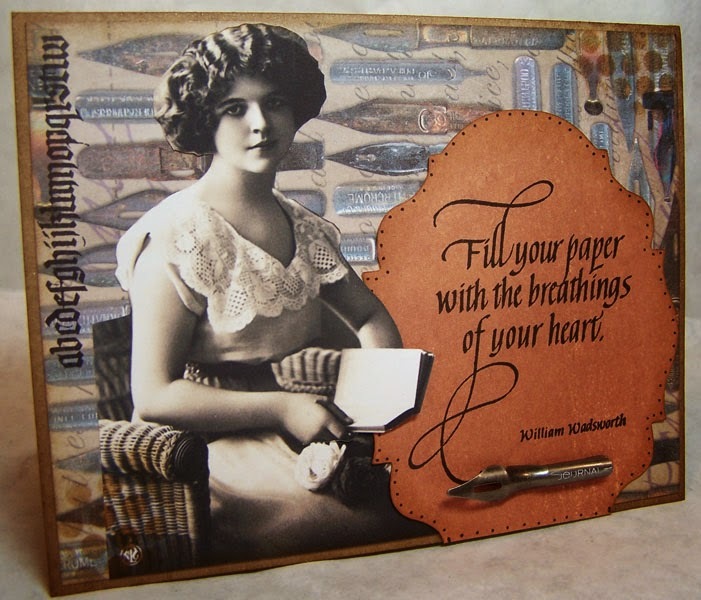 Cut brown cardstock to 8-1/2" x 4-1/4" and fold in half to make a square card. Cut Kraft cardstock panel slightly smaller than card front and round the corners. Use VersaMark to stamp the large butterfly. 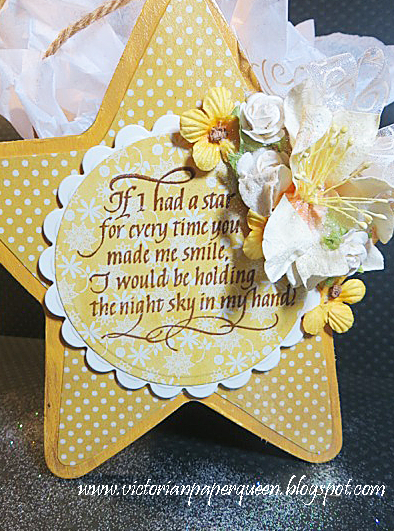 Use Pearlescent Chocolate to stamp the sentiment. Remove the release paper from one side of 3D Foam Butterfly and press variegated gold flakes onto adhesive. Run around the edge of the shape with a coloured marker to cover white edges. Remove the release paper from the bottom of the butterfly and adhere near sentiment. Use Crafty Foam Tape to attach the panel to the card front. 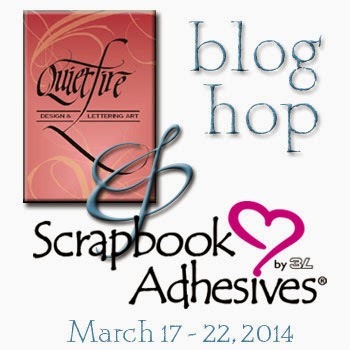 Scrapbook Adhesives and Quietfire Design are giving away two prizes valued at $60 each. Enter our raffle for a chance to win $30 worth of Quietfire rubber stamps AND $30 worth of Scrapbook Adhesives by following the instructions in the Rafflecopter box below. Comment on each blog post this week to enter to win! One (1) comment per person per blog post. 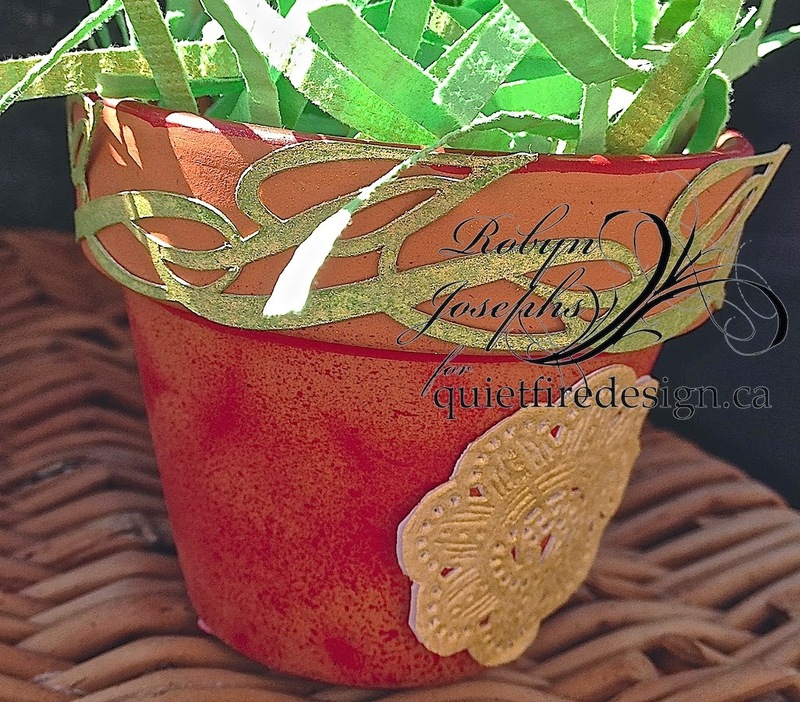 Winner will be randomly drawn on 3-24-2014 and announced here on the Quietfire Creations blog! Earn additional entries by following us on Facebook and Twitter! 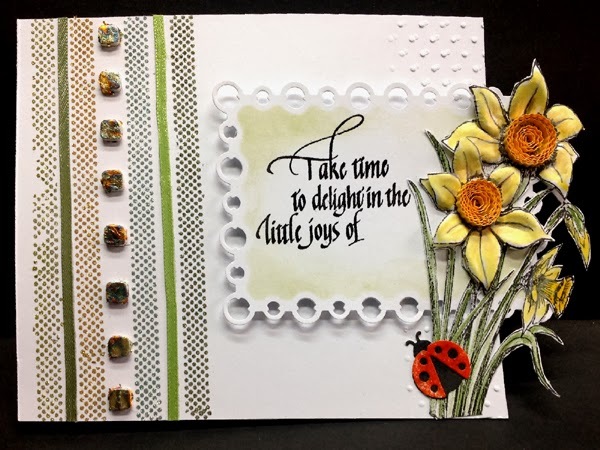 Enter our contest here, then go over to the Scrapbook Adhesives blog to see their project of the day and enter their contest, too! Happy Friday to you all!!!! 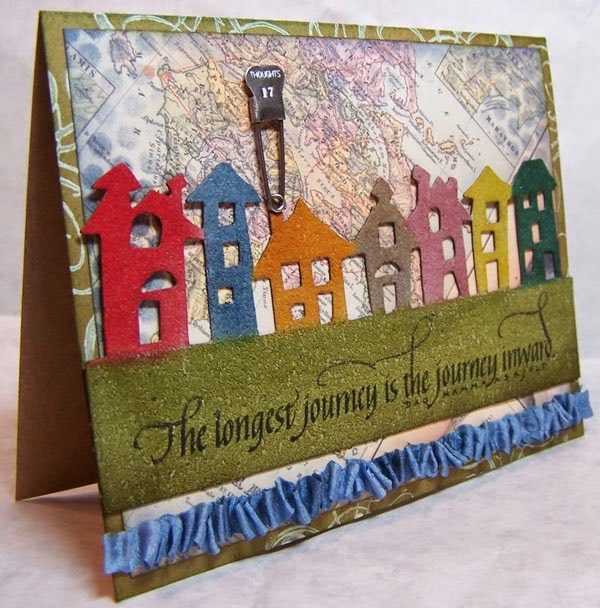 Wanda here and I hope you've been having a good time hopping along with Quietfire Design and Scrapbook Adhesives by 3L. If you've missed any of the posts this week, be sure to check them out and leave a comment on each one. Most days on this blog there have been two different posts for the hop so don't miss out. I've been using Quietfire stamps for years and you all know that I love them. However, I had never used Scrapbook Adhesive products before or made it a point to work the adhesive into the design. This was a challenge for me but after I got going, it was a lot of fun!!! So much fun that I had a hard time stopping as you can tell since I have three projects to share. So we better get on with it!!! This first card uses ideas that I had swirling about my noggin' as I thought about the adhesives I had to use and "what am I going to do with them". Since the 3D Foam Squares I got come with 2 different sizes in the package I thought it might work to stack them and I wanted to try them with embossing powder. 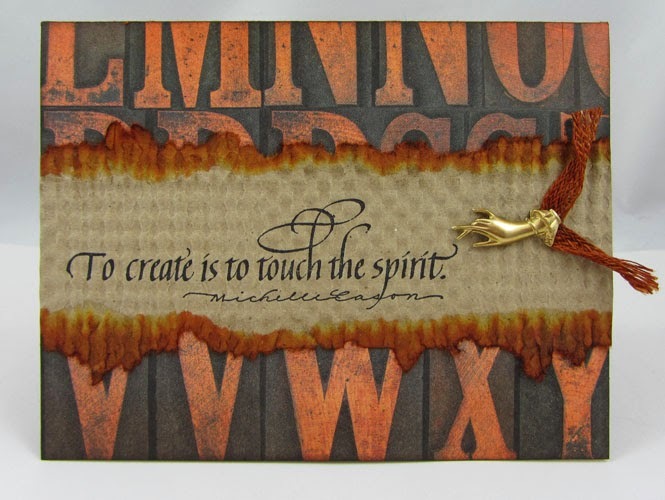 I chose Distress Embossing Powder for the extra texture. I stuck the larger squares to my strip of paper, took the liner off the top, put on the smaller squares leaving their liner on the top. Poured on tea dye powder and shook off the excess... perfect. Don't heat yet. Take the liners off the small squares and pour on fired brick powder. Shake off the excess and now you can heat the powder. Worked great!!!! The adhesive on these squares is VERY sticky!!! They stay where you put them and they hold what you put on top of them... no changing your mind, lol!!! Now for my background and accent papers. Since I had already decided on what colors of embossing powder I was using on the squares I wanted my background to match. I started with a piece of Specialty Stamping Paper, cut it in half, laid both halves in front of me, sprayed them both with some water and then "sprayed" (yes, I've taken some of my stains and put them in mister bottles so I can spray them - fun, fun, fun!!!) Distress Stains (wild honey, fired brick, barn door, tea dye, spiced marmalade) just on one of the papers creating puddles of color, no skimping on the spraying here. Then I took the other piece and laid it on top, pressed them well together, pulled them apart, and used a paper towel roll to pick up excess stain. My paper towels have a pattern and it left that pattern in some areas of the papers - very cool!!! I set one piece aside and it is the piece I used to tear the strip for behind the squares and to stamp and die cut my quote (Dream with your eyes wide open) - LOVE this quote!!!! For the other piece I started with the Dylusions letter jumble stencil and the black Dylusions spray, spraying lightly through the stencil, moving the stencil and spraying again. I blotted the ink with the paper towel roll and dried the paper. Next I used the Dylusions number jumble stencil and sprayed barn door stain through it, again spraying, moving, spraying, blotting and drying. I decided what size I wanted my background to be and cut it from my paper. I had first thought I would put the squares directly on the background but after it was made I realized they would get lost and I needed to do something to highlight them. Tearing a strip from the other paper was perfect as it matched so well but also was much lighter than the background. 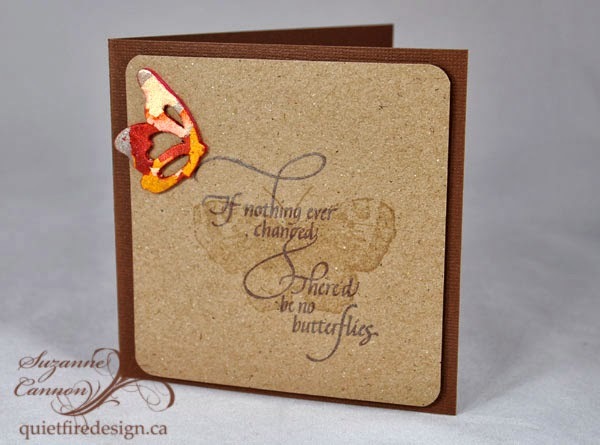 The quote was stamped with jet black Archival ink and fit perfectly in the Spellbinders Butterfly Circles die. To finish it off I took one butterfly from the 3D foam butterflies package, stuck it on my craft sheet, carefully poured Distress fired brick powder in the center area and then Distress spiced marmalade on the rest of the butterfly. These shapes are so sticky that I actually had to work at getting it up off my craft sheet so I could dump off the excess powder and heat it. But I got it up and it worked great!!!!! Some powder got on the back as I was taking it off the sheet but since I didn't want the whole thing to stick down that was a plus. I heated the powder and it also caused the butterfly to bend up a little - yay!!! The butterfly foam was white and to make it match my squares better, I used a black Sharpie marker to color the edges and then used small Dodz just in the center of the butterfly to stick it down. I took 3 white pearls, colored them with the Sharpie marker and stuck them to the butterfly. I adhered the whole piece to a folded black card with the small Dodz. Next up I have a tag. To be honest, I made the tag first. Since I thought I was going to be putting the squares directly on my background of the above card, I decided maybe I should test my idea of stacking the squares and adding embossing powder, so I grabbed a #5 Ranger tag and put four large squares along the bottom, took off the liner, added the small squares (liners still on), poured on tea dye powder, took the liner off the small squares, added pine needles powder, shook off the extra and heated them. Now I knew it would work great for the card since it worked on the tag. I originally had a different color scheme in mind which is why I used the pine needles powder on my test (which in the end I covered up, I'll get to that). The squares looked so good that I thought I should do something with the tag, I couldn't just leave it!!!! I was ready to use tea dye, old paper, and antique linen Distress Stain in mister bottles to make my background so that is what I used on the tag. I stood the tag up, did close sprays of color letting the color run down the tag. I was really liking this!!!! Dried the tag, laid the letter jumble stencil on and sprayed black Dylusions. Next came a few mistakes that I kept trying to fix. I thought I would outline the squares in white to make them pop more and grabbed my Sharpie Paint marker. Not only did it make a line but the foam soaked up some paint which I didn't like, plus I couldn't get it in-between the squares very well... ugh. Now what to do, I'll use a Black Permanent Sharpie just to color the sides of the squares... nope, got black lines on my background, but finished doing the edges of the squares so they would be black again. Ok, I'll spray lots of black around the squares to cover up the black lines, so did that and blotted it off. Too dark, just not right. Ok, I'll use some white Dylusions, so I sprayed some of that and blotted off the excess. Ok, we are looking better but still not quite right.... I took a small paint brush and added back in more black Dylusions below the squares. The white paint that I had first put by the squares was resisting the black but I did have more of a fade to black at the bottom and the white was acceptable. Yay, something I could live with as I just didn't want to throw it away!!! So now which stamps should I use to finish it up. I started flipping through all my QF stamps and when I saw "Never Give Up", I thought it was appropriate after what I had just been through trying to make this tag work, lol. But I should put something with it and I thought one of the birds would work great. The bird is stamped on a scrap of manila card, embossed with black powder, and cut out leaving a small border. When I had stood the tag up to spray it, I was holding it with a piece of paper which of course got spray on it and that is what I used to stamp Never Give Up onto and cut it up. Hopefully Suzanne isn't cringing too bad since I split up the beautiful flourishes hooking all the words together!!! I put these onto black cardstock using small Dodz and cut again leaving a border. 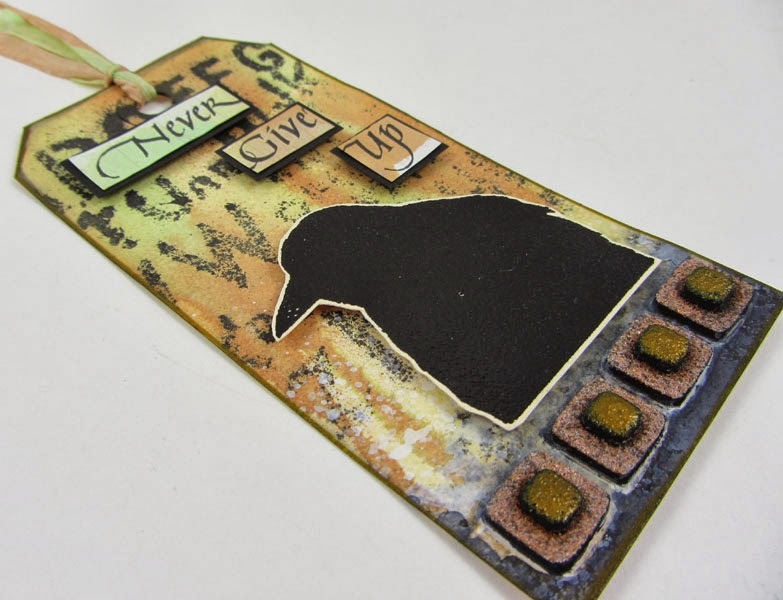 The words and bird are attached to the tag using 3D foam squares. Some black ink around the edged and stain dyed silk ribbon finish it off. Oops, that wasn't the end. I decided a little metallic would be good. I went around the edges with Distress Paint tarnished brass and also added it to the tops of the small squares along the bottom. The green powder was very dark and I wanted to lighten it up a bit. I love that the texture still comes through!!! I was having so much fun and didn't want to stop so I thought something bright and springy would be my next project and I wanted to do something with the 3D Foam Creative Sheets package I received. My first thought was to die cut something and I was leaning towards having a flower on my project. I also needed to decide what I wanted to stick to the foam. Foil (Jones Tones rainbow) would be bright and shiny and I hadn't used mine in a long time. I die cut a Spellbinders scalloped circle from the white sheet of 3D foam. I also cut a smaller circle from cardstock to be the center of my flower. Before putting the foil on the circle I thought I had better try it on something smaller, just in case. A butterfly would be great with my flower so I used one of the 3D foam butterflies. The foil worked great!!! So next I foiled the scalloped circle. I wish you could hold this piece and see the sparkle and shine that pictures just don't show!! For the center piece, I stamped "Inspire" with jet black ink and also inked around the edge with mustard seed Distress Ink. For the stem I cut a piece of black Crafty Foam Tape from the roll and then cut about 1/3 off the whole length of the piece so that it would be narrower. Next I took a piece of 13mm silk ribbon, colored it with meadow Distress Stain, dried it, and wrapped it around my piece of foam tape. 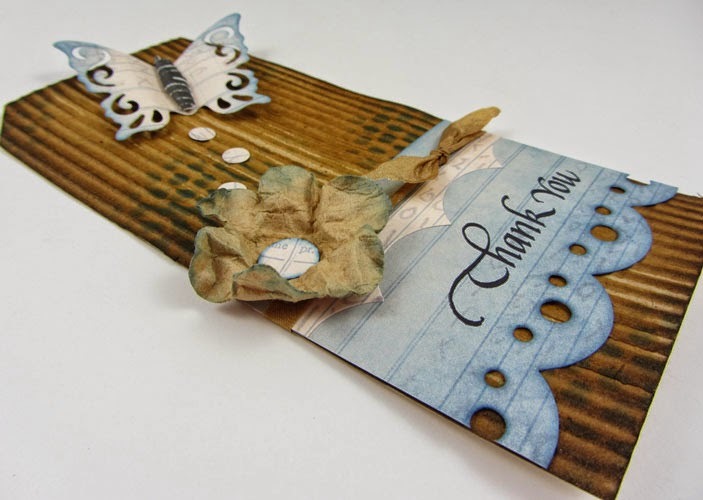 The leaf is cut from watercolor paper using the Tim Holtz Tattered Leaves die. I colored the whole leaf with Distress Stain meadow and then added a bit of pine needles Stain along the bottom and picket fence Stain along the top. I used a bone folder to press some veins into the leaf (not easily seen in the pictures). The stem and leaf are attached to the card with small Dodz. For the flower, I removed the liner from the back but I did not want the whole piece to stick down so I painted around the edge with Distress Paint tarnished brass, let it dry, and then stuck the flower down. Since the foam is so sticky the center holds it just fine and I could bend up the edges a bit to give the flower more dimension. The center is attached with a foam square. I did the same thing with the butterfly - I painted the back of the wings but not the center so it would only stick in the center. I also painted the edges of the wings using a small brush rather than the sponge top of the paint. The edges of the background are doodled on using a black Pitt pen. I hope you've enjoyed my projects and didn't mind my rambling too much :-)) Be sure to scroll to the bottom to leave a comment and enter the drawing to win a great prize!!! 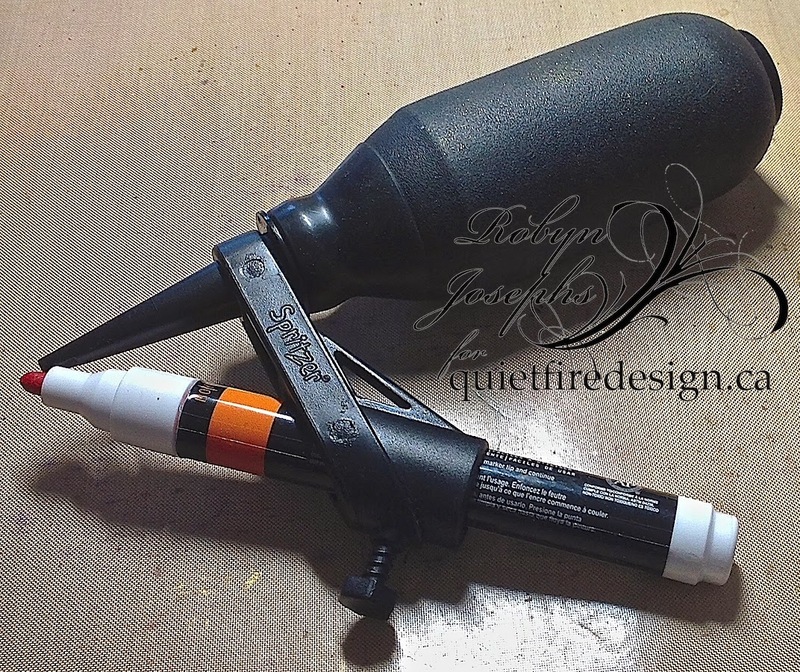 Scrapbook Adhesives and Quietfire Design are giving away two prizes valued at $60 each. Enter our raffle for a chance to win $30 worth of Quietfire rubber stamps AND $30 worth of Scrapbook Adhesives by following the instructions in the Rafflecopter box below. Comment on each blog post this week to enter to win! One (1) comment per person per blog post. 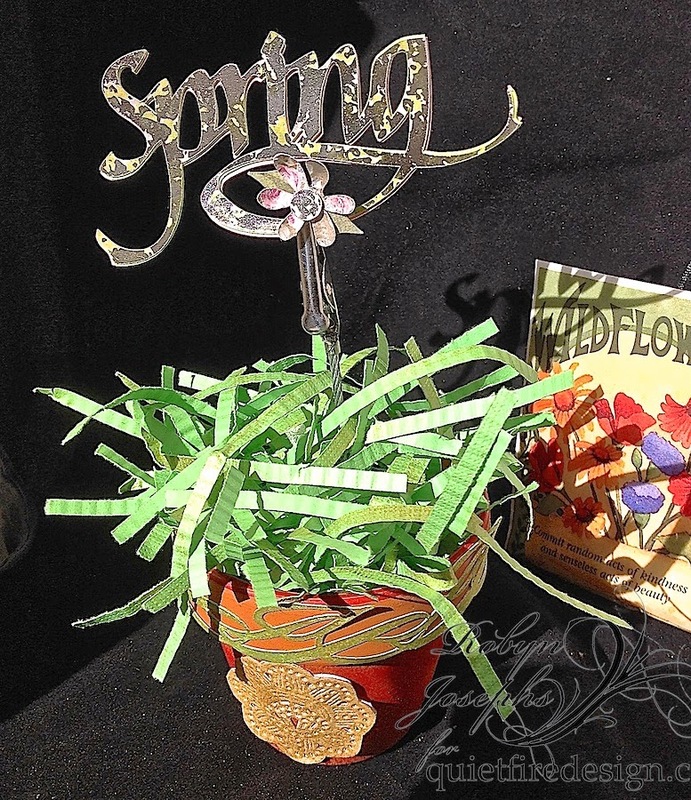 Winner will be randomly drawn on 3-24-2014 and announced here on the Quietfire Creations blog! Earn additional entries by following us on Facebook and Twitter! 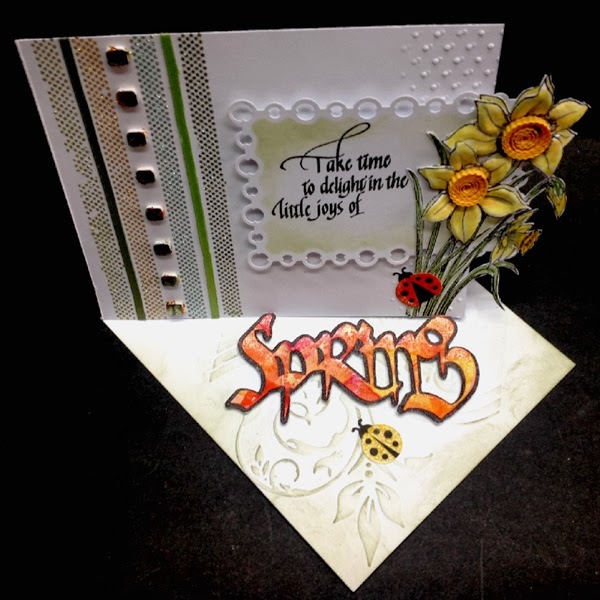 Enter our contest here, then go over to the Scrapbook Adhesives blog to see their project of the day and enter their contest, too! 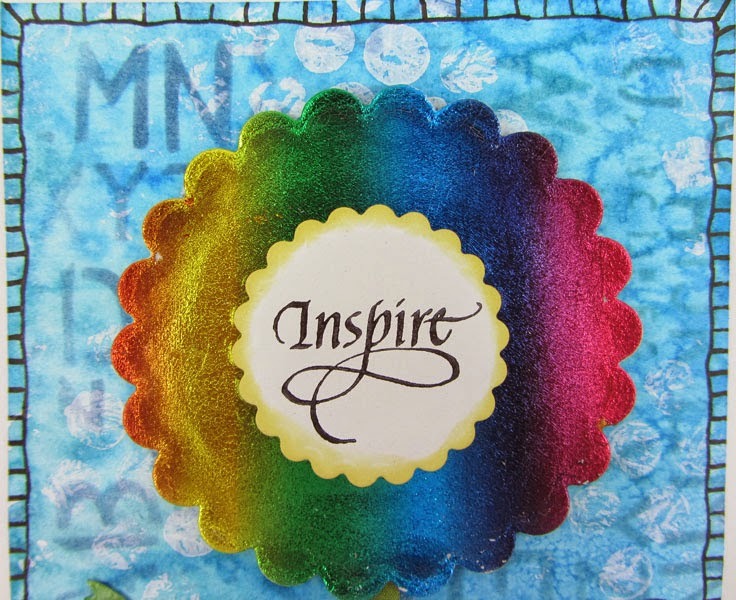 Welcome to our blog hop with Scrapbook Adhesives, makers of quality and creative adhesives! Thanks for dropping by. I cut my white cardstock (5"h x 11"w), scored and folded similar to this diagram but changed the height to 5". Scored at the 5" mark on the left of the 11" side of my cardstock. Then scored the diagonal line. Folded the front flap in and layered another piece of white cardstock that was decorated below, the same size as the base of the floor and adhered to the front flap (see gluing area on the above diagram "glue front here"). I love the dots from the Scrapbook Adhesive E-Z Dots runner. 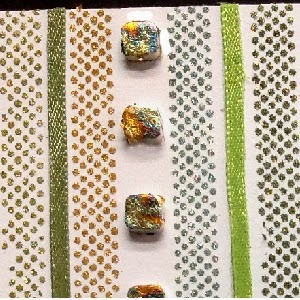 I applied vertical lines on my white cardstock and sprinkled with various colors of Glitter Ritz micro fine glitter (Chartreuse, Gold, Celadon & Peridot), burnished well. Adhered the small 3D foam adhesive squares and applied Green Variegated gold leaf to them and brushed of the excess using the brush that comes in the Perfect Pearls set. Then adhered the narrow ribbon in 2 shades of green using the Crafty Power Tape. Embossed the right side using Cuttlebug "Swiss Dots" folder. As mentioned above adhered this layer to the front of my side easel card. Stamped the quote (masking of the two words "the Season") using Versafine Black Onyx and clear embossed. Die cut with Spellbinders "Pearl Effects Card Creator", sponged Distress "Forest Moss" around the edges and adhered to card front - off set - using the larger of the 3D foam squares. 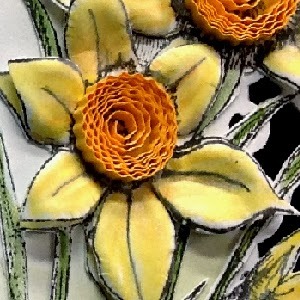 Stamped the daffodils (Art-Kure "Daffodils") twice on white cardstock using the black. Colored with Prisma colored pencils, then fussy cut the 1st stamped image all around. Fussy cut the 2nd stamped image, but only the individual petals (one at a time), and used a large balled stylus to shape the petals on a piece of fun foam. 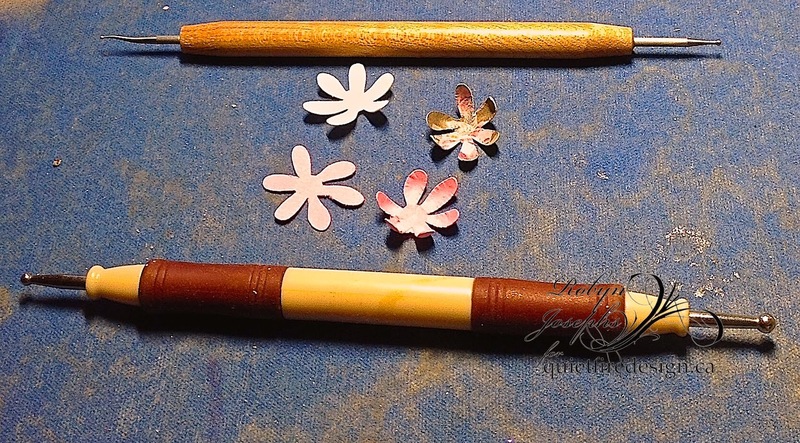 Dipped the edge that falls in the center of the flower in some glue and adhered to 1st stamped flower. Repeated till all petals were adhered. Used a strip of quilling paper and crimped it prior coiling and allowing the coil to loosen, adhered the end and then adhered the coil to the flower center. Adhered the flower to the card front - off set again. Die cut the lady bugs (eCraft Designs). Colored the body with a black Zig writer, then the wings with Distress, "Persimmon" or "Mustard Seed" and clear embossed. Adhered the wings to the body and on to the card. Embossed the floor of the card using Couture Creations Romantique Series "Breeze" and sponged some Moss over the high points. 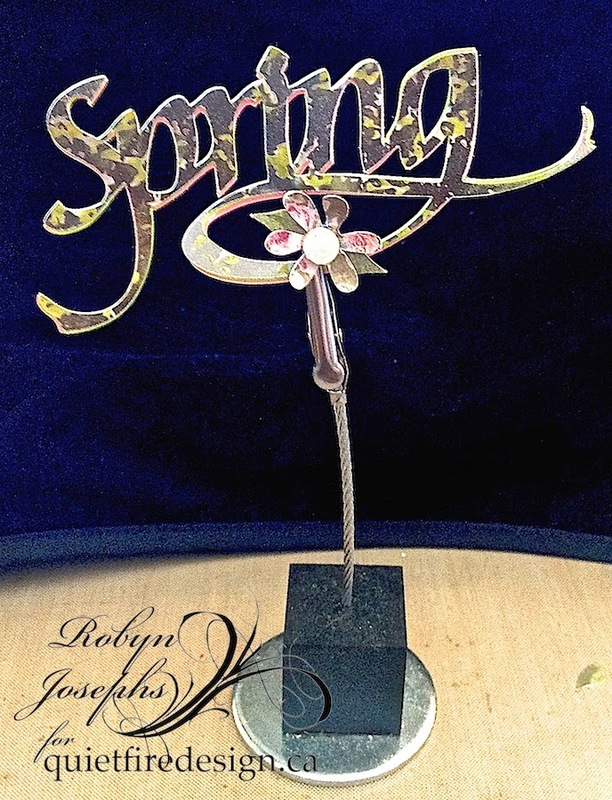 Calligraphed and created the eCut the word "Spring" from white cardstock including a shadow layer. Applied Distress pads direct to paper in the Mustard, Persimmon & Picked Raspberry, then added some of these colors to a craft mat. Misted the eCut with water to blend some of the color and then smeared it carefully on the wet craft mat, dried. Repeated till I got the right concentration of color. Applied Versamark all over the colored letters and clear embossed. Ran the shadow layer through my Zyron, burnished well to remove the overspill of the glue, adhered my colored letters then sprinkled with Glitter Ritz micro fine glitter "Java Bean". Burnished and wiped off the excess. Adhered to floor of card with the small 3D foam squares. Blog Hop! Look for the Dream and 3D Foam Squares! 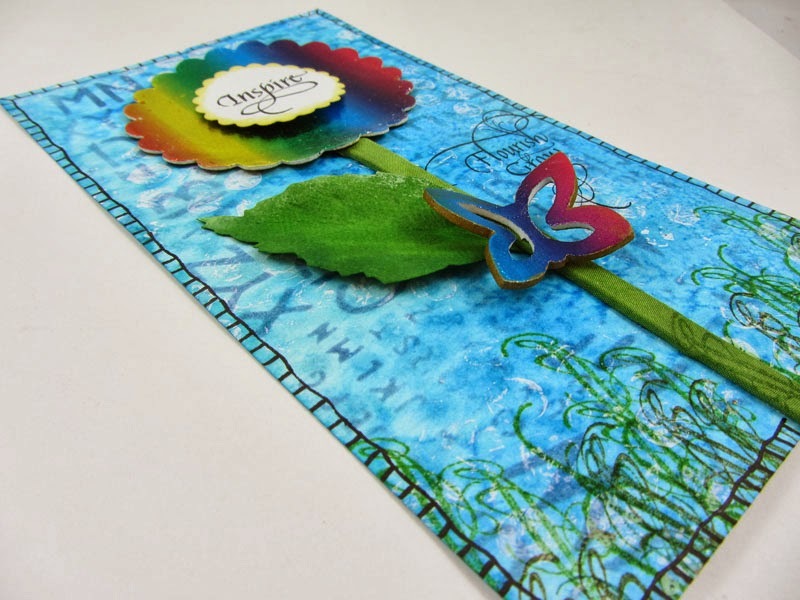 We're Blog Hopping with Scrapbook Adhesives! I Wouldn’t Have Missed Being Your Friend!